Examples of breeds that are brachycephalic include: Bulldogs, Boxers, Boston Terriers, Pekingese, Chinese Pugs, Lhasa Apsos, Shih Tzus and Bull Mastiffs. 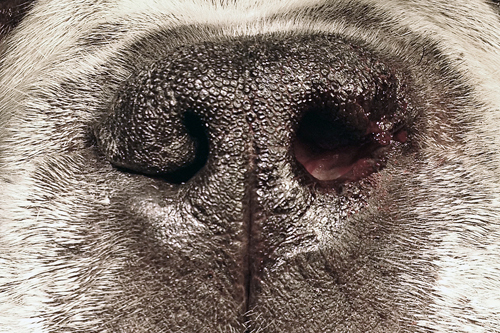 Brachycephalic airway syndrome refers to a particular set of upper airway abnormalities that affects brachycephalic dogs. Any of these upper airway abnormalities can cause increased airway resistance, increasing the effort required to inhale. Most dogs with this syndrome are able to breathe more easily through their mouth than their nose. Since obesity worsens the symptoms of brachycephalic airway syndrome, weight loss is important if the pet is overweight. For dogs with only mild or intermittent symptoms, their condition may be managed conservatively by controlling exercise levels, avoiding hot or humid conditions, keeping the dog in an air-conditioned place during the summer, and avoiding stress. If you have any questions regarding brachycephalic airway syndrome or think your dog is suffering please, give us a call to find out more!